Things are better this morning. Life seems to have returned to pretty much where it was before seeing Bean on Monday night. Which is kind of strange for me ... all these emotions coursing thru me and suddenly things are back to normal. It feels like there should be something more, you know? I still feel sad. But my life is fine, okay even, without Bean. I will survive, obviously. It just seems strange to miss someone that much when you're around them ... but given a little space, you're fine. Maybe it's just me? Anyway, yesterday afternoon Varen rushed over after work to give me a much needed hug. Yes, I know we work together, but there are two offices and yesterday morning I decided I wanted to be in the quieter one ... and the one he wasn't at. I knew this would all add strain to us and whatever was going on there. It did. But as I said, he's decided to stick around this crazy person for the time being and showed his fortitude with a quick visit to check up on my emotionally fragile state in person, which was mostly spent shopping up a storm of snacks for my impending Book Club. Oh, and can you believe I left the million peppadews I'd hand stuffed with feta in the fridge ... :( We found them when we packed away the leftovers. How disappointing! 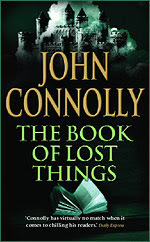 On the topic of books and reading, on Sunday morning I finished reading John Connolly's Book of Lost Things. Obviously due to the trauma in my life since then it dropped fairly low on the list of things to blog about ... which is why it is late. I quite liked this book. It's not quite what you expect and although it does have the twisted fairy tales and it's not kiddie reading by any means, the book is still essentially about a young boy. As far as twisted fairy tales go, however, my favourite still remains Roald Dahl's Revolting Rhymes. Last night, I finished my first Book Club book. 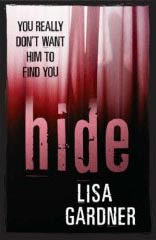 Okay but, I cheated because I started it on Sunday since it was one of my Book Club book buys - this was my month and I got fabulous books - well in my opinion, of course ;) It was Lisa Gardner's Hide. In bestseller Gardner's first-rate follow-up to Alone (2005), Bobby Dodge, once a sniper for the Massachusetts State Police and now a police detective, gets called to a horrific crime scene in the middle of the night by fellow detective and ex-lover D.D. Warren. An underground chamber has been discovered on the property of a former Boston mental hospital containing six small naked mummified female bodies in clear garbage bags. A silver locket with one of the corpses, which may be decades old, bears the name Annabelle Granger. Later, a woman shows up at the Boston Homicide offices claiming to be Annabelle Granger. Her resemblance to Catherine Gagnon (whose life Bobby saved in Alone) helps stoke a romance between her and Bobby both subtle and sizzling. The suspense builds as the police uncover links between patients at the hospital and long-ago criminal activities. Through expert use of red herrings, Gardner takes the reader on a nail-biting ride to the thrilling climax. I've read a couple of Lisa Gardner's books and enjoy them. This one was gripping. If you like crime fiction, you'll enjoy this. Although none of the lead characters are forensics experts (which usually seals the deal for me), it's good reading. I bought this book on Saturday - woohoo, can't wait to read it! It is Hide - I don't usually read forensic-type books, but there was something about this one that appealed to me. I feel a nerdy-saturday-night-in-bed-reading kinda weekend coming on! I'm glad things ar starting to settle for you, better. I hope it all stays good too. @phlippy - thanks :) and Loulou says John Connelly is brill, but I don't think I've read any of his other stuff ... will keep an eye out tho!